Honesty, I think some of you will love Alpha. And I'm sure you will want to see it if you love dogs and man's relation with dogs, and if you love nature spectacle and state-of-the-art wide-screen cinematography/special effects ideal for iMax viewing, and if you love Kodi Smit-McPhee (The Road, Let Me In, The X-Men, etc., etc.). But I can't entirely justify loving this movie. I love dogs, and I've long been fascinated with theories about them starting with On Aggression author Konrad Lorenz. Surprisingly, the director of Alpha is Albert Huighes, who used to work with his twin brother Allen, directing movies like Dead Presidents, Mennace II Society, From Hell and The Book of Eli. They do make sense I guess growing up black, and in Detroit. Alpha (see the trailer - but it's misleading) takes place 20,000 years ago among tribes or clans in vast landscapes who once a year hunt bison by walling them off, spearing them, and forcing them to fall off a cliff. The clan leader, called Tau (Jóhannes Haukur Jóhannesson, who looks like the young Orson Welles, which I see Glenn Kenny also noticed), takes his teenage son Keda (Smit-McPhee) on the bison hunt, with another clan. Keda gets caught up on the horns of a bison, tossed in the air (in a spectacular slo-mo shot) and falls off the cliff, caught on a tiny ledge, almost perpendicular and unreachable. It's a devastating sequence, heartrending and terrifying to watch, but also gorgeous. The widescreen aerial photography with use of slo-mo and speeded-up images is truly state-of-the art, beyond spectacular, awesome, and beautiful, and has been linked with the art-documentary trilogy that began with Koyaanisqatsi. Some have thought this combo of prehistory fable and modern day art landscape photography incongruous. But why not? This may be a far-fetched, partly fairy tale film, but it's a highly accomplished one in which Albert Hughes and a superb crew display a wealth of talent. It's a globe-trotting landscape here that includes British Colombia, Ireland, Iceland, and New Mexico. Flashbacks to one week earlier. (Some reviewers thought it funny you could have weeks, when it's 20,000 years ago. Why not?) We learn that Keda's mother (Natassia Malthe), thought he wasn't ready for the hunt, because he was more connected to his heart than to his spear. Tau tells Keda to finish off a beast the clan has attacked, but he can't bear to do it. Keda is a softie. That fits the very tall but etherial Smit-McPhee, who frankly not only seems sensitive, but more suburban than primitive. But he is a brilliant, go-for-broke actor, and since one of his earliest roles was in the future dystopia film from Cormac McCarthy, The Road, you can see this as a prequel to that. Though clan leader, Tau is a softie too, in a way. Because the other clan's chieftain's son gets killed and his father barely sheds a tear, just says something stoical and noble, while Tau wails for hours. By the way, all Alpha is entirely in a made-up language, with subtitles, like the talk of the Amazonian tribe in John Boorman's Emerald Forest (an old favorite of mine). Smit-McPhee will do a lot of talking throughout the film, mostly to a wolf, whom he names Alpha (not "Alpha" though in the language), which his father had told him designates the leader of a pack that fights its way to the top and has to fight to stay there. Keda and Alpha become the first man-canine partnership. The clan leaves Keda for dead, but he regains consciousness, wounded severely in the foot, and also perched on a tiny ledge on a 180-degree sheer cliff. His struggle begins, and we follow him as he brings out survival skills he learned in the clan. Once he's up and about, and off the cliff, on a barren plain with a single shell of a ruined tree, he's attacked by a pack of wolves. Fighting to survive, Keda begins finding his spear and overcoming his soft-heartedness. He stabs the head wolf and wounds it, and the other wolves flee as he takes refuge in the shell of the tree and the wounded wolf is left lying below him. Keda winds up rescuing the lead wolf and making them partners on an arduous journey back to his clan home. The goal is to make it back to home before the snows of early winter come. Keda uses a tattoo of the big dipper on his hand as a guide to find the way. There are many obstacles, starting with simply making fire. He kills a rabbit, and establishes dominance over the wolf, telling it he gets to eat first and then the wolf. I have no idea that any of this corresponds with known science, but visually it is splendid. It's been reported that 8-year-old boys love it, even though it scares them and makes them shield their eyes and hold their ears. Kids are tougher than they're given credit for in the suburban world, and they love adventure and dogs. The ending is happy, and the final shot is a stunner Konrad Lorenz might have loved. Note that while thrilling and at moments scary, this is not a sentimental tear-jerker of a film in any respect. The focus is too much on survival to allow for much emotion at all, though you do begin rooting for Alpha and for the relationship to survive. 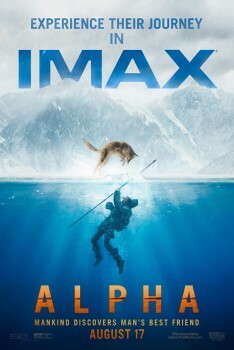 Alpha is played by "Chuck", identified on Wikipedia as a Czechoslovakian Wolfdog, a relatively new breed blending German Shepard and wolf developed in the Fifties. Alpha is a beautiful creature, looking, as you'd expect, given the origins of the breed, somewhere between dog and wolf. This is a satisfying fable rather than scientific speculation: it's unlikely that the immense relationship between man and dog evolved anything so rapidly and propitiously as it happens here. But isn't it nice to think so? An awesome and satisfying film, during and around which I have willingly suspended all the disbelief I arrived with from the moment I saw the trailer and knew I'd want to see it. This is, it's often pointed out, a conventional tale, and unusual for this blockbuster era when every big summer movie has a number after it and comic book characters. So it's both unusual and quite familiar. It's also, despite the fantasy and wish-fulfillment elements, full of survival of the tough sort, like living off maggots and bugs and getting caught under a frozen lake. After a break, it's also Albert Hughes showing himself to be an even better and more versatile director. As Owen Gleiberman says in his admiring and admirable Variety review, Hughes here "proves to be a seductive if highly traditional craftsman who knows how to sculpt a drama of the primal human spirit out of sweeping images: a herd of mastodons, a billowing volcano, a racing warthog, sun and wind and ice and plunging cliffs." Yahoo! The summer has come up with something fresh, memorable, and fun. Alpha, 93 mins., was released 16 Aug. 2018 in some countries, 17 Aug. 2018 in others including the US, in many others to come through December, 24 Aug. in the UK. Metascore: 62%.